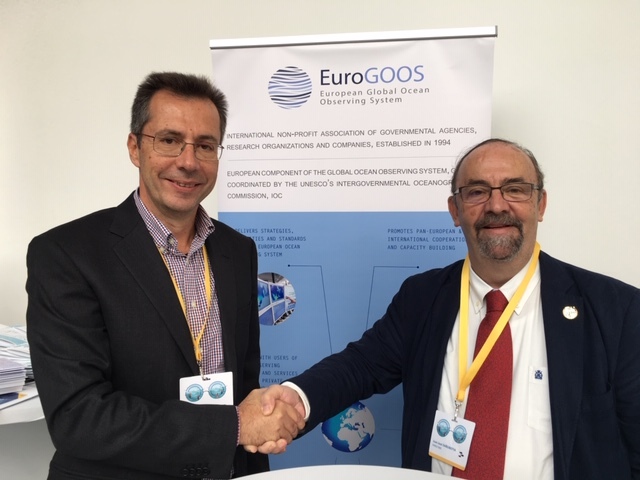 Today, at the EOOS conference in Brussels, the EuroGOOS chair George Petihakis, and the EMSO director-general Juanjo Dañobeitia signed a memorandum of understanding between the two organizations to strengthen partnership in promoting the European ocean observing efforts. Cementing the already ongoing collaboration, EuroGOOS and EMSO agree to jointly coordinate the EuroGOOS Task Team on ocean observing fixed platforms, strengthening the oceanographic research cooperation within the EOOS framework. The organizations will also jointly promote and contribute to a sustained in situ component of the Copernicus Marine Service and support the development of common operational data procedures and services, including data quality control and management. “We look forward to strengthening our cooperation with EMSO in promoting ocean observations in general and the EOOS framework in particular, and to deliver tangible joint actions fostering Europe’s leadership in ocean observing and services”, shared George Petihakis, EuroGOOS Chair. EuroGOOS, the European Global Ocean Observing System, is an oceanographic association of national agencies, research organizations, and private companies, working within the intergovernmental Global Ocean Observing System (GOOS). EuroGOOS is one of the UNESCO-IOC Global Ocean Observing System regions and is currently Chair of the GOOS Regional Alliances Forum. EuroGOOS is also playing a central role in fostering and supporting the development of a common framework for European ocean observing, EOOS. EMSO, the European Multidisciplinary Seafloor and water-column Observatory is a European Research Infrastructure Consortium (ERIC) supporting a system of fixed-point observatories owned and managed by European organizations that provide data for monitoring of marine environments, spanning the Arctic, the Atlantic, the Mediterranean and the Black Sea. EMSO offers data and services to a large and diverse group of users, going from scientists and industries to institutions and policy makers. “We have been working with EuroGOOS for some time in an open and cooperative way. This MoU will build on our successful partnership to deliver a strong and resourced EuroGOOS task team on fixed platforms and support the community in provision of data and services for sustainable blue economy”, said Juanjo Dañobeitia, EMSO ERIC Director General. The MoU was symbolically signed at the stakeholder conference dedicated to building an integrated and fit-for-purpose framework of European ocean observing capacity, EOOS.